So the rumors are true. This foundation is amazing. It's my new go-to. I was expecting this to be super overhyped and average. I expected it to be average of a good high end foundation, but nothing special. I was wrong. Let's start with the packaging which is luxurious and high end looking and sturdy. It is functional and beautiful. It has buildable coverage starting out as medium/high and if you need extra one day you can add a second layer to really give you what you need. My skin is SUPER dry, especially in the winter, and this foundation moisturized without adding shine. It is a semi-matte finish, and it is so hard to find things that are hydrating without a shiny, dewy or luminous finish. This one has the closest "skin-like" texture and finish that I have ever seen. Fenty Beauty has been highly applauded throughout the makeup community for having a super wide shade range. I have heard it said that Rhianna (who - just in case you didn't know - is the owner of this beauty brand) told Sephora (where this foundation is sold exclusively) that they had to carry EVERY shade in EVERY location. I think that is awesome! And I honestly don't doubt it because I live in Utah where our population is like 90% white. It's hard to find darker colored foundations here, in fact my best friend from California used to have me send her favorite Maybelline foundation because stores don't carry her shade in CA because they have more darker toned because and she is super pale. However they have the darkest Fenty shade in our Sephoras as well as the lightest. Some other notes about this foundation is that it is scentless, which I prefer. It is long lasting (especially with a primer and setting spray, but I did find it to last longer without those than my other favorite brands) and it is only $34 for 1.08 oz. Which is nothing compared to MAC, Laura Geller, Philosophy or Urban Decay. Most high end brands are $38+ for only 1 ounce. All in all I highly recommend this foundation! I really wanted to be the first blogger to not be obsessed with it, but I am. I had actually JUST bought a brand new bottle of my go-to, and returned it after buying this as it is my new go-to. Also (and this is my personal experience and not a claim of the brand) but my skin has never looked better! I have even been lazy in all of this holiday craziness and not washed my face before bed a few times and my skin doesn't break out. I have never had more compliments on my complexion, and I am just thrilled with it entirely. There are SO MANY good deals right now for the holidays. I decided not to post this year about my fave finds from Black Friday, because I just assumed that every makeup lover is on the look out for great beauty finds on Black Friday and Cyber Monday. However Ulta has added yet another event with great deals! They have their semi-annual 21 days of beauty and now they are doing the "Holiday Beauty Blitz" which includes 25 days of "surprise deals" to countdown to Christmas. I wanted you all to know about it, because these deals are insane. They only have 5 revealed and the first one is today! It's the Smashbox Drawn in Decked out Palette! It normally retails for $42 and is on sale at 50% off today making it only $21! It includes a cool matte contour, bronzer and highlight, 2 blushes and 15 eye shadows. I know this sounds like a sales pitch but I am not making any kickbacks or money or sponsorship fees for this post. 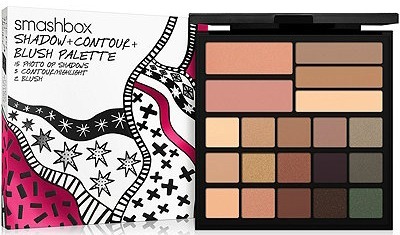 I just already own this palette and it was well worth the $42, so at $21 it is a STEAL! You can pick it up from Ulta here. But whether or not this palette is your style I am impressed with the five deals Ulta Beauty has revealed so far. I guess they reveal five deals every five days during this sale. Check out all the deals here and keep coming back to make sure you don't miss one! Spoiler alert, they have 50% off a product from Becca on Tuesday!